In this liver video, learn what damages your liver, the symptoms of liver dysfunction, and how you can naturally regenerate your liver. Once you understand the functions of the liver, liver disease, and how to repair it, you can learn how to perform a complete liver detox. Watch this video and then view the link at the bottom of this article for step-by-step instructions. Too much protein in the diet. Protein metabolism is especially taxing on the liver since it is the liver which must metabolize complex proteins into simple compounds. The greater the consumption of protein, the greater the stress on the liver. Too many simple carbohydrates in the diet. The body converts excess simple carbohydrates into triglycerides, which are then stored in the liver as fat. The more fat stored in the liver, the harder it is for the liver to perform its full range of normal functions. Overeating. Too much enzyme deficient food stresses the liver. Drug residues. Virtually all of the drugs that we take (medicinal, recreational, chemotherapy, whatever) are processed, purified, and refined in the liver—in preparation for elimination from the body. Alcohol causes inflammation of the liver's tissue. Once the liver is inflamed, it can no longer filter, which causes it to plug up with fat and become even more inflamed. If we consume enough alcohol, we overwhelm the liver's ability to regenerate itself, and the net result is cirrhosis (or hardening) of the liver. Toxins, heavy metals, and pesticides. Everything we breathe, eat, and absorb through our skin is purified and refined in the liver. What Are the Symptoms of Liver Dysfunction? In Chapter 6 of Lessons from the Miracle Doctors, Jon discusses the elements of proper diet. Well, they particularly apply in terms of the liver. You need to eliminate (or at least cut back) the liver stressors in your diet. The sicker you are, the more cleaned up your diet needs to be. If you're suffering from serious liver problems, a raw juice diet may be required to give your liver time to regenerate. The poor gallbladder. Guilty by being found at the scene of the crime, it is the frequent target of the surgeon's knife. Gallbladder removal is one of the most frequently performed operations in America. In fact, over a half-million gallbladders are removed each year in the United States. Since you never corrected the underlying problem of imbalances in the liver, these problems will just continue to get worse—eventually compromising the liver itself. By doing a liver cleanse detox, we're talking about inducing the liver to purge all of the fats, old cholesterol deposits, gallstones, poisons, drug residues, and toxic waste stored therein. Probably nothing else you do (including even the bowel cleanse and detox) will make a greater difference in your overall health. NOTE: Do not do the liver detox without cleansing the colon first. Colon detoxing is the foundation for the Liver Detox. 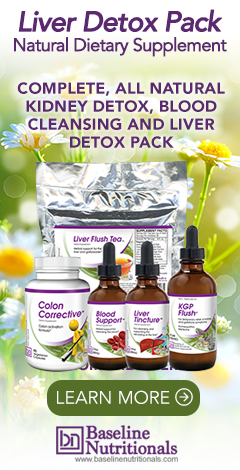 If the intestinal tract is not functioning at 100% during the liver detox, many of the toxins being dumped by your liver will back up into your bloodstream, making you feel very unwell. Learn more. Finally, read ALL the instructions for the Liver and Gallbladder Cleanse before starting. For those who don't want to do the full liver flush that involves a 3 or 5 day fast, there is a slow and easy version that will give you 70-80% of the benefit without the difficulty. As part of your daily diet, just eat one cup of freshly grated beets mixed with olive oil and lemon juice for 30 days straight. Daily use of the Liver Flush Tea is required and one bottle of Liver Tincture is highly recommended. Interested in a full body detox that incorporates the liver detox? Start at the beginning and learn how to safely perform a full body detox through our free Self-Guided Detox Program!